The organ at First Presbyterian Church began its musical life in 1928 as Op. 720, a classic example of the work of Ernest M. Skinner. It was one of four instruments in Battle Creek built by the Skinner firm in the late twenties. Beginning in the 1950s, tonal changes were made: pipes salvaged from a local Johnson replaced several ranks; in the 1960s Casavant added a Great Mixture and replaced the entire Choir save for the original Skinner Clarinet; finally, in 1979 the organ was extensively overhauled by George B. Price of Tekonsha, Michigan, with new windchests and pipework added to the existing mechanisms. At this point, the Skinner organ was essentially no longer, save for the main windchests and a half-dozen ranks of pipes. By the late 1980s, the organ was plagued by mechanical problems in both the console and the windchests, and it was apparent to First Presbyterian that a corrective, long-range plan ought to be developed. In 1991, we were asked to develop such a plan. Our proposal described a new instrument which reused as much material of the old organ as possible in a way which was consistent with our philosophy of mechanical reliability and tonal quality. A contract for this work was signed in April, 1993. The basic layout of the organ, with Great and Pedal in the left chamber and Swell over Choir in the right, was retained from the original Skinner organ. It was decided that the original Skinner windchests, extensively and unfortunately modified by Price in 1979, would be replaced with electric-slider windchests. 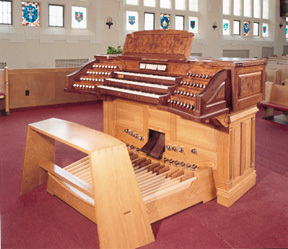 Existing components included in the new organ are some reservoirs, the original blower, static reservoirs and metal windlines, the 1979 Pedal windchest, the original tremolos and swell engines, the original framing and swell fronts, as well as nearly all existing pipes from the previous organ. An entirely new console, combination action and switching system were provided. Unlike the previous console (which replaced Skinners original), the new console is movable; though it controls a much larger instrument, is smaller in every dimension than the old console. Significant features of the new instruments tonal design are a substantially new principal chorus on the Great, a completed principal chorus in the Choir, and the addition of important new solo colors such as the Great Harmonic Flute and Cornet, and the Choir Tuba. * denotes that some or all of the stop is from the original Skinner organ. + Choir Separation allows Tuba to play from Choir manual, while the remainder of the Choir can be coupled to other divisions. GREAT ORGAN -- 61 Pipes 6"
8' Tuba (heavy wind) 10"
SWELL ORGAN -- 73 Pipes 6"
CHOIR ORGAN -- 73 pipes 6"
PEDAL ORGAN -- Augmented 6"
ECHO ORGAN -- 61 5"
Adjustable at the console and visibly operating the draw stop knobs.